Welcome to the 2013 *October* edition of the Wednesday Artisan Blog Hop. Check back every Wednesday to see new projects that all 10 of the Stampin' Up! Artisans have created. Is it really October already? Since I'm *trying* to stay a month ahead on project, it should be no suprise that even though we'll be eating TONS of candy for Halloween, all projects will be about giving thanks, fall, and harvest. The new Expressions Thinlits Dies: GET YOURS NOW!!! This is probably one of the easiest cards to create. To get the cool look of the leaves, separate 1 leaf. How do you do that? Smash, crinkle, and crumple your paper. You'll notice that the edges of your leave are starting to separate and peel apart from each other. Slowly peel the papers apart to get 2 leaves. Squish/fold the middle of the leave so it gives it a little more dimension and helps it to pop off the page. Glue dots and dimensionals on the back will help your leaf stay put. Such a cute card. I love the extra texture that you gave the leaves. Lovely as always Jane! I love that technique of separating cardstock, it looks and feels like suede! Great job! Love the colors and textures in this card. Beautiful! thank you for the tip on the leaves. they are especially nice. thank you for your talent also. Awesome, as usual! 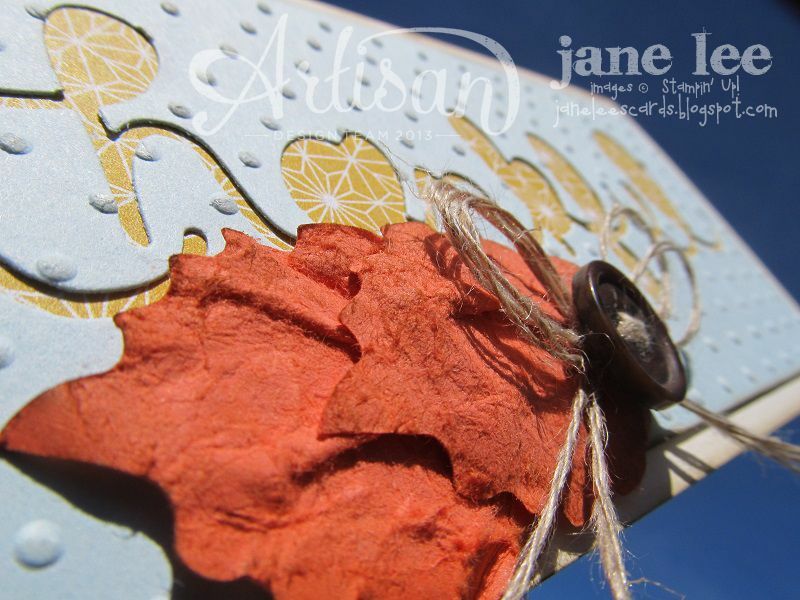 Love the separated cardstock texture on the leaves! Love the leaves - I have been making lots of leaves lately for my Autumn creations but never thought of crimping them!